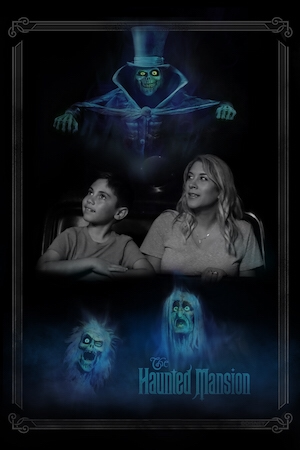 Disney has debuted a new on-ride photo for Haunted Mansion and the way they have seamlessly incorporated it into the ride is impressive. A while back, Disney replaced the portraits in the first hallway scene. They quietly installed cameras behind the portraits to capture your on-ride photo with an extra flash of lightning. We rode the attraction this morning to capture the effect. You can see it three different times in the video below. It seems like the extra bright lightning flash happens once every four doom buggies or so, in between regular lightning flashes. Here’s a look at the photo produced by the on-ride photo.